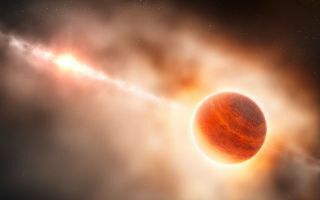 This artist’s impression shows the formation of a gas giant planet in the ring of dust around the young star HD 100546. This system is also suspected to contain another large planet orbiting closer to the star. Image released Feb. 28, 2013. The picture, which captured a giant alien planet as it is coming together, was snapped by the European Southern Observatory's Very Large Telescope in Chile. It shows a faint blob embedded in a thick disk of gas and dust around the young star HD 100546. The object appears to be a baby gas giant planet, similar to Jupiter, forming from the disk's material, scientists say. The possible planet seems to fit the picture scientists are building of how worlds form. Stars themselves are born in clouds of gas and dust, and after the form, a disk of leftover material often orbits them. From this disk, baby planets can take shape. That's what appears to be happening here. This composite image shows a view from the NASA/ESA Hubble Space Telescope (left) and from the NACO system on ESO’s Very Large Telescope (right) of the gas and dust around the young star HD 100546. Image released Feb 28, 2013. The observations were made possible by the NACO adaptive optics instrument on the Very Large Telescope, which compensates for the blurring caused by Earth's atmosphere. The instrument also uses a special coronagraph that observes in near-infrared wavelengths to block out the bright light from the star, so as to see its surroundings better. The findings are detailed in a paper to appear online in today's (Feb. 28) issue of Astrophysical Journal Letters.